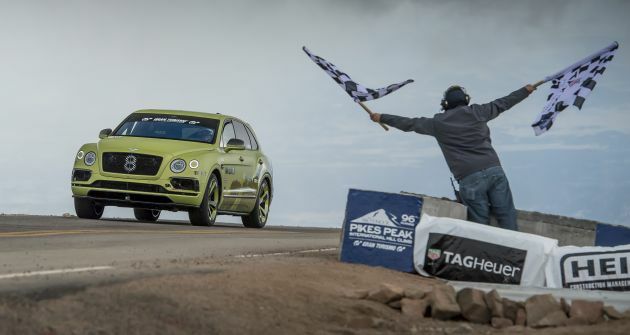 A lightly modified Bentley Bentayga has successful set a new production SUV record at last weekend’s Pikes Peak International Hill Climb with a time of 10 minutes 49.9 seconds, which is two minutes less than the previous record. During the run up the nearly 20-km course, the Bentayga driven by Rhys Millen averaged a speed 107 km/h as it navigated the 156 corners and 4,720 feet climb. “What an incredible machine. To take a luxury SUV with minimal modifications and be able to drive up this course in under 11 minutes is a huge testament to the performance and level of engineering in the Bentayga,” said Millen. “I had a great run – the car was planted all the way up and gave me the confidence I needed to push hard. I’m delighted to take the SUV record for Bentley and for everyone that’s been involved in this project,” he added. Modifications made to the SUV include a roll cage, fire suppression system, racing seat and new Pirelli tyres. The SUV also makes do without 300 kg of interior trim and gains an Akrapovic exhaust system to make the 6.0 litre twin-turbo W12 engine (600 hp/900 Nm) sound better. The vehicle was also finished in a Radium Satin paintwork and Bentley’s Styling Specification kit – adding a carbon fibre front splitter, diffuser, side skirts and rear spoiler. To celebrate the occasion, Bentley introduced a new limited edition Pikes Peak Bentayga which is limited to just ten units. The work of its bespoke division, Mulliner, the unique Bentley can be had in either Beluga black or striking Radium, furnished with 22-inch wheels in a two-tone finish of Beluga with Radium accents. There’s also the Black Specification included, where all exterior chrome bits are replaced with gloss black components and a carbon-fibre splitter, side skirts, diffuser and rear spoiler are added. A subtle Pikes Peak motif is placed on the front fenders. wow, 900NM. That is super torque….